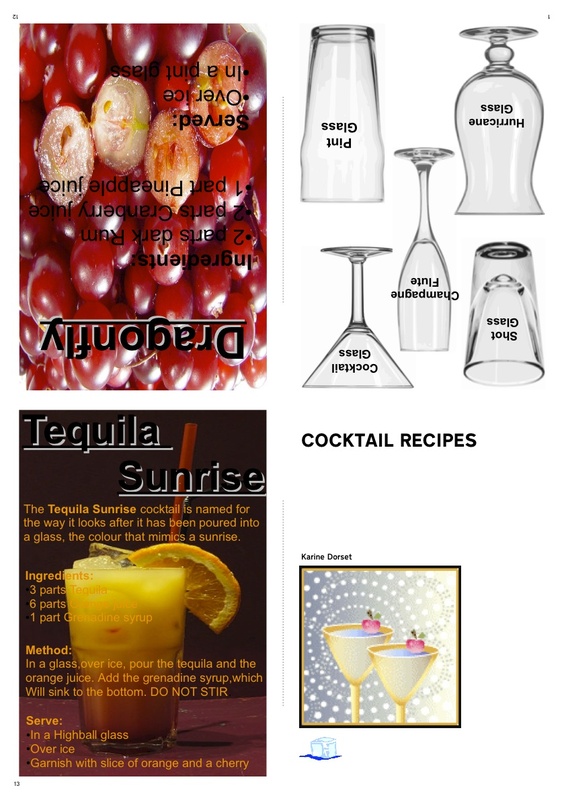 About : Cocktail Recipes is an eBook designed for people aged 18 years and over. It’s about making cocktails, which can be fun, and can also give you ideas for parties or a night in with your friends. I started off by looking for very different types of cocktails, form each other, and even looked at some of their history. I then collected images that related to the cocktails to add that decorative effect. Using Neo Office Drawing, I arranged the images and content I had to present this eBook. It was fun researching for this eBook, I even tried a couple or recipes my self. Make a couple yourself and see how fun it is. Karine Dorset is a Communications Assistant at Proboscis as part of the Future Jobs Fund Placement scheme. Originally trained as a chef, she is broadening her creative horizons and exploring other forms of creativity. About : Greenhill Digital Storytelling Guide: This is a short guide to community research and how the digital story is formed. It details some handy hints about how you identify interviewees, writing your interview questions and how you actually build a historical digital “story”. These stories can be really engaging because they mix images with a real experience of life in a particular community. They can also be shared really easily and are very cheap to produce if you don’t have much of a budget. You can record interviews and combine the voice with digital images from archives or images of objects that have meaning, to create something really visual and emotional. 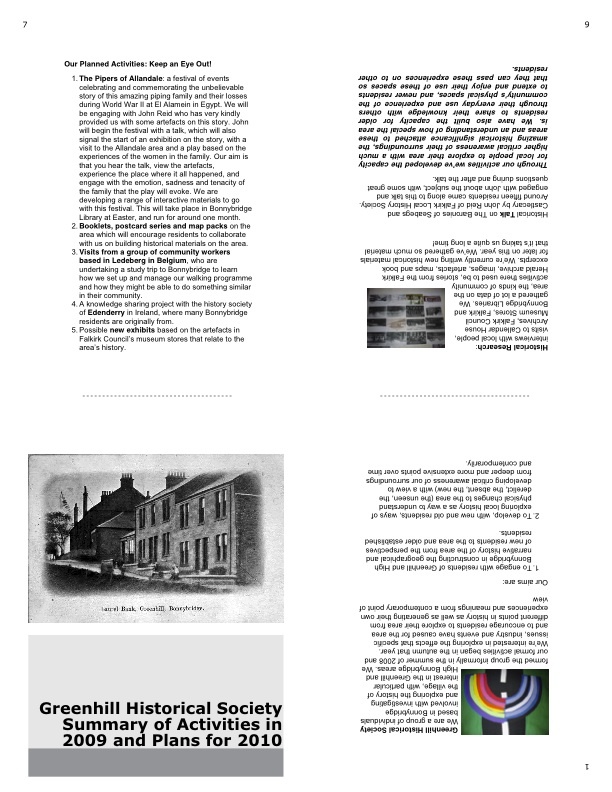 Summary of Activities 2009 and plans for 2010: This booklet details the Greenhill Historical Society’s wandering and exploring. A “village” situated in Bonnybridge, Greenhill has experienced a significant amount of upheaval and change over the last century. Most recently, hundreds of new and expensive houses have been built on vast tracts of greenbelt; mineral industry, predominantly mining, is all but gone. We’re interested in what this means for the area now. If Greenhill will never be as great as it once was, what does that mean for us? We hope that by exploring the derelict, the hidden, the new, the old, the stories of new and old residents we can come up with a new definition for this place. 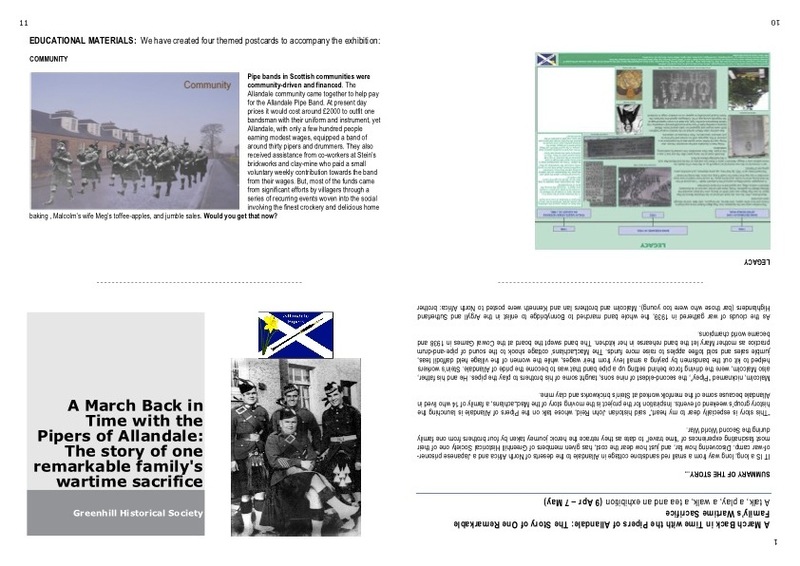 A March Back in Time with the Pipers of Allandale: This project retraces the story of one remarkable family’s wartime sacrifice and the heroic journey taken by four brothers during the Second World War. Greenhill Historical Society created a weekend programme of events so that others could share their discoveries – a talk, a play, a walk, an exhibition, and a daffodil tea – as well as a chance to engage in debate about the issues it generated. 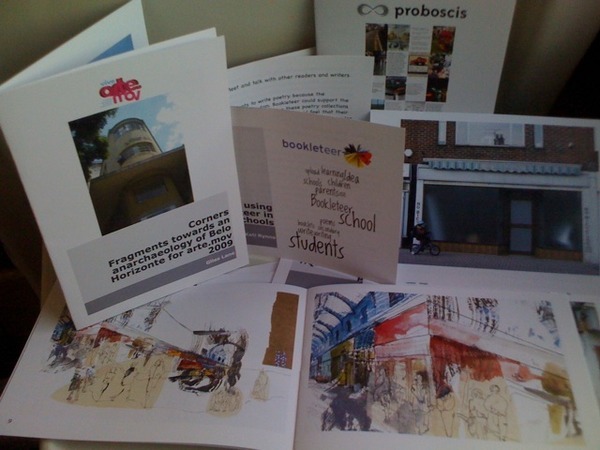 This booklet contains a summary of the project as well as smaller versions of the exhibition and printed materials for you to view. Gillian Cowell is a community worker and researcher based in Bonnybridge, Stirlingshire, and a doctoral student at the University of Stirling exploring civic learning and the construction of public space. Her research interests include public sphere and public space theory towards a better understanding of community education as public education. 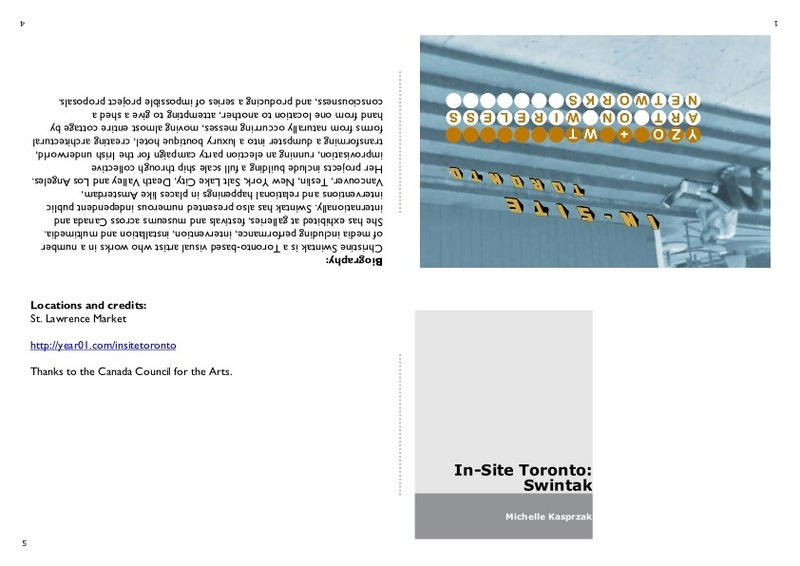 She is involved in exploring derelict and historical spaces of post-industrial communities with residents, and how these spaces transform into public and political sites, revealing and reigniting debate about contemporary challenges. 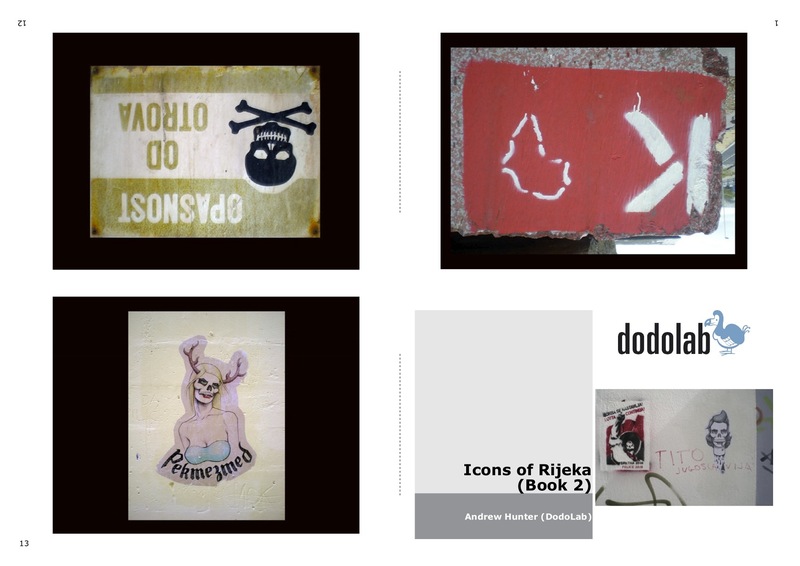 About : This eBook was produced by participants Nataša Flac, Bruna Tomšić, Marta Maričić, Iva Santini, Ana Hrćan and Majd Al-Shihabi (DodoLab) in a Youth Workshop on public spaces run in Rijeka, Croatia, by Andrew Hunter and Lea Perinic, June 18-19, 2010. DodoLab is an art and design based program that employs experimental and adaptive processes to spark positive change and resiliency. We work collaboratively with a diversity of emergent thinkers/doers to imaginatively and critically repurpose familiar tools of the social sciences, marketing and activism to engage with the public in public. Our focus is the complex relationships between people and their surroundings and how communities define, and are defined by, their environment. DodoLab puts the creative process at the heart of confronting social and environmental challenges. 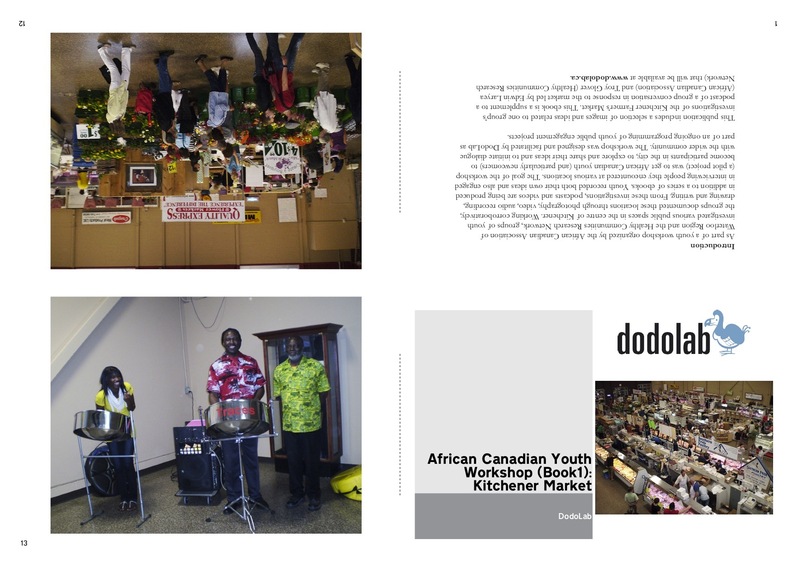 About : A youth workshop developed by DodoLab in collaboration with The African Canadian Association of Waterloo Region and the Healthy Communities Research Network. 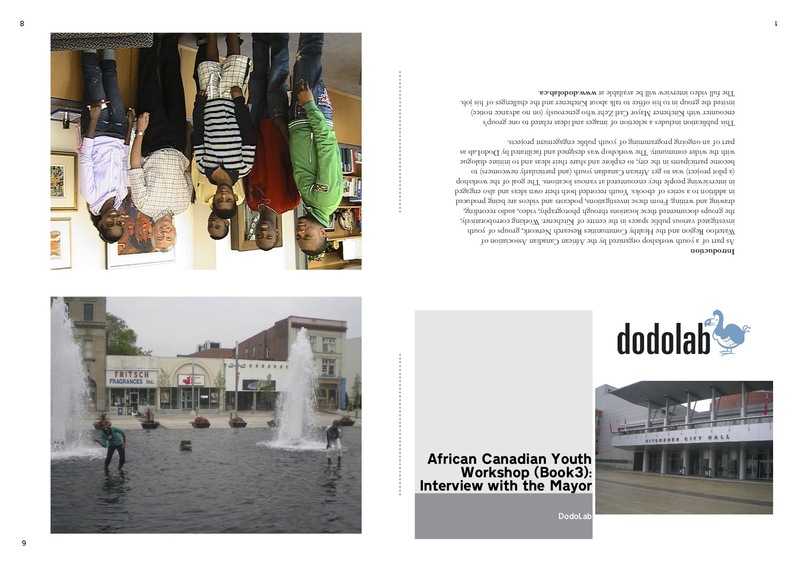 The workshop took place on June 25, 26 & 28 2010, in Kitchener Ontario with participants from the African Canadian Youth Leadership Project. A field notebook was designed for the workshop participants by DodoLab and three eBooks were created by the participants in the workshop. 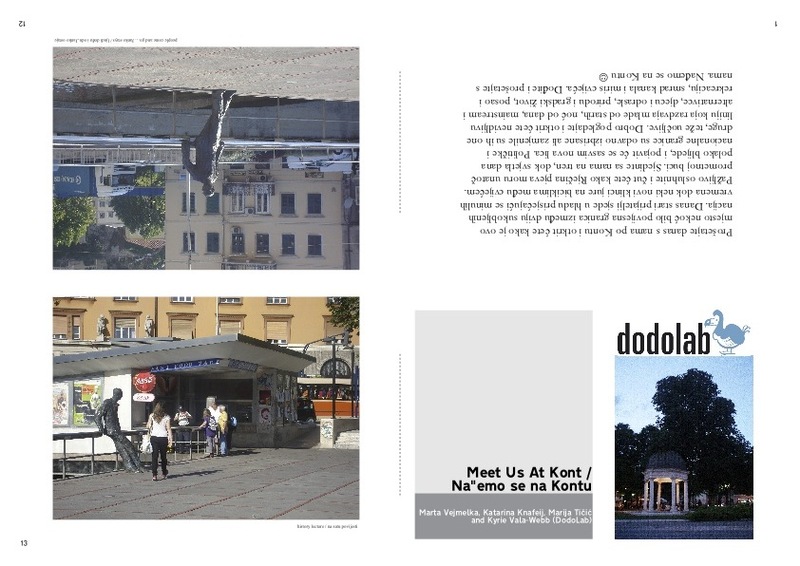 About : This eBook was produced by participants Marta Vejmelka, Katarina Knafeij, Marija Tičić and Kyrie Vala-Webb (DodoLab) in a Youth Workshop on public spaces run in Rijeka, Croatia, by Andrew Hunter and Lea Perinic, June 18-19, 2010. About : This eBbook was produced by participants Sanja Orlić, Kristina Utković and Ferdinand četaj in a Youth Workshop on public spaces run in Rijeka, Croatia, by Andrew Hunter and Lea Perinic, June 18-19, 2010. About : This is a field research work book for participants in a Youth Workshop on public spaces run in Rijeka, Croatia, by Andrew Hunter and Lea Perinic, June 18-19, 2010. Part 1 involves groups of participants responding to questions. Part 2 asks the participants to engage the public in conversation. 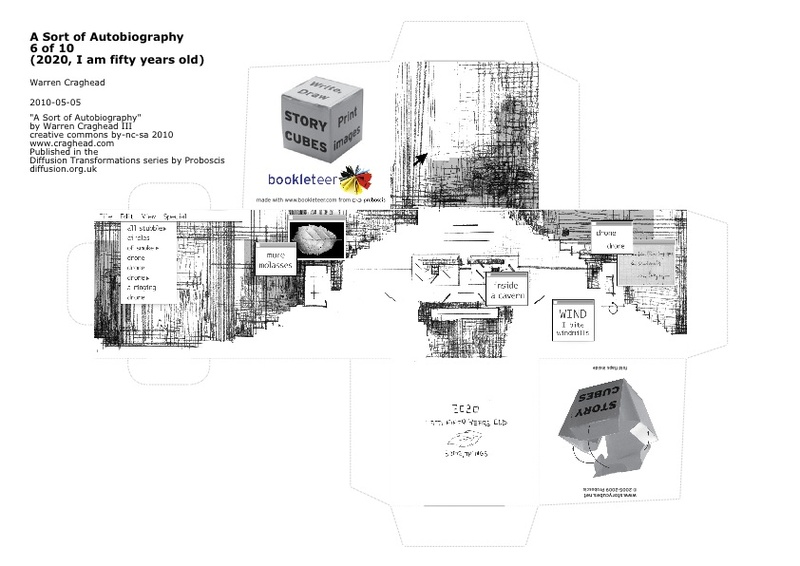 Part 3 will involve photographing the spaces to generate publications and online surveys. 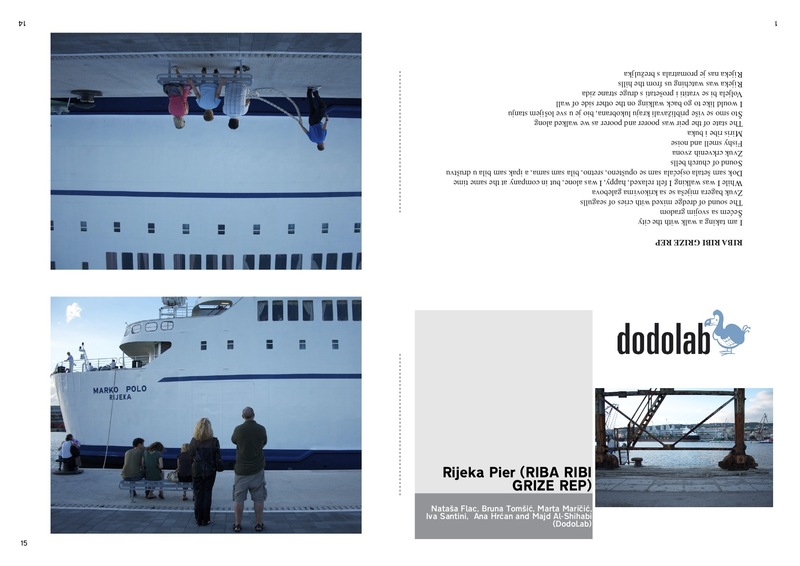 The three sites in Rijeka being investigated are the Korzo, Pier and Cont Square. 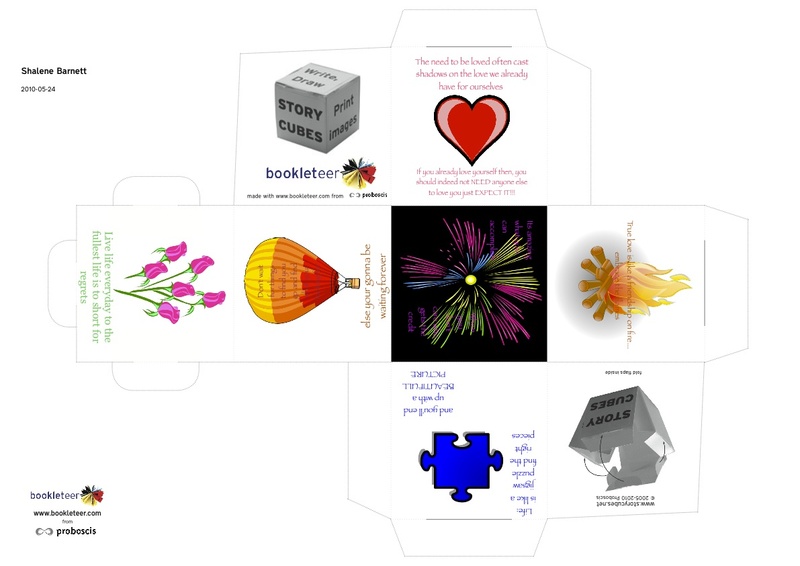 About : I initially came up with this idea when brainstorming for usage of the eBooks. The thought book originally started as a personal diary but then transformed into a thought book for both sexes and also different age groups. 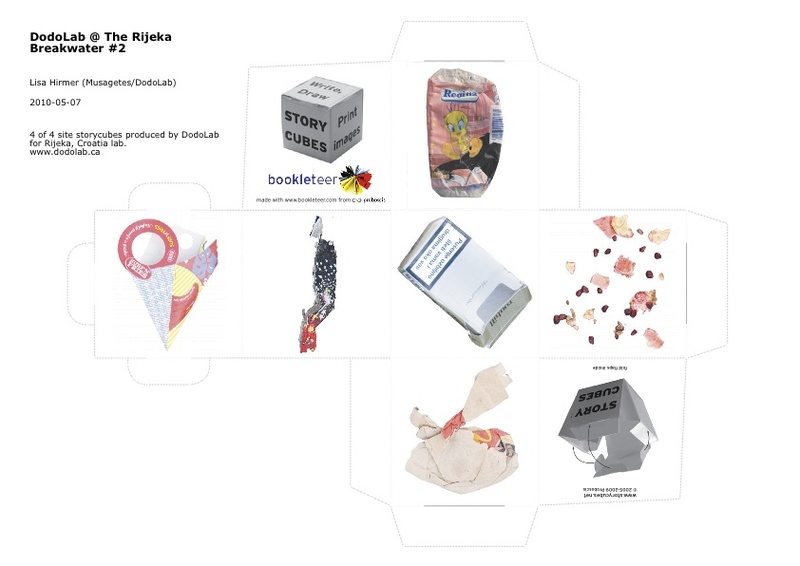 The design of the thought book is so simple it can be made at home. 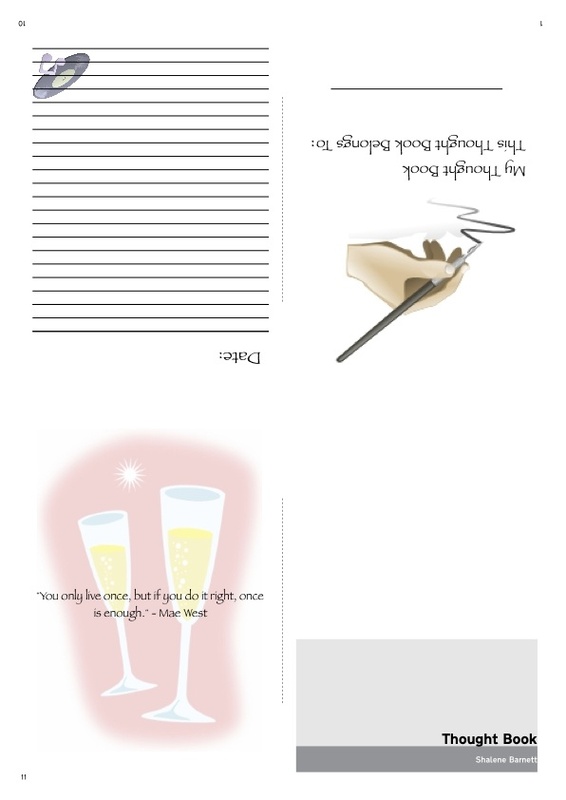 I started off by accumulating different phrases, and then getting clipart to accompany the phrases. They then had to be arranged which was fun. I used a software package called Neo Office which allowed me to write text on top or behind pictures/drawings. I then had to create a template with lines in order to create a notepad which I was easily copy and pasted to create a few notepad pages. I am extremely pleased with my thought book and invite you to try and make your own. Shalene Barnett is a Communications & Coordination Assistant at Proboscis as part of the Future Jobs Fund Placement scheme. Shalene is a qualified legal secretary and studied for 2 years at City of Westminster college. She then went on to work in the legal field for a few years. As enjoyable as this was Shalene was very interested in exploring a more creative style of work, and was able to do so here at Proboscis. 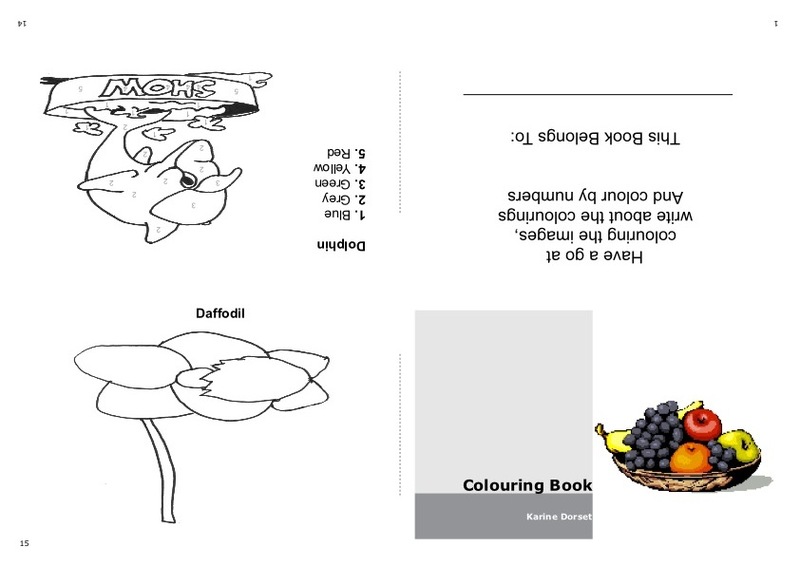 About : Cook ‘N’ Colour is an eBook designed to help create bonds between children and adults. This eBook was based on the thought of being able to let children cook easy to do recipes and get creative by colouring in the drawings of the finished dishes. 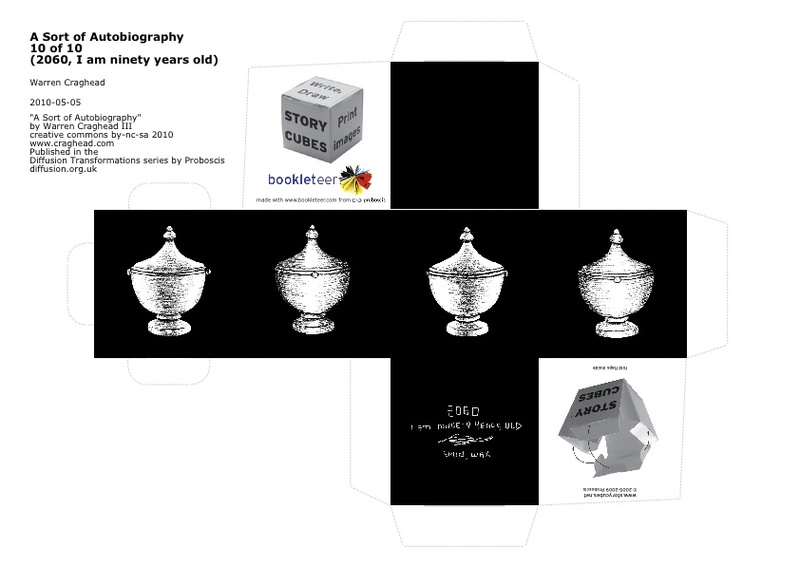 I got the recipes from my own knowledge of the dishes and printed, traced and scanned the images to my own design. 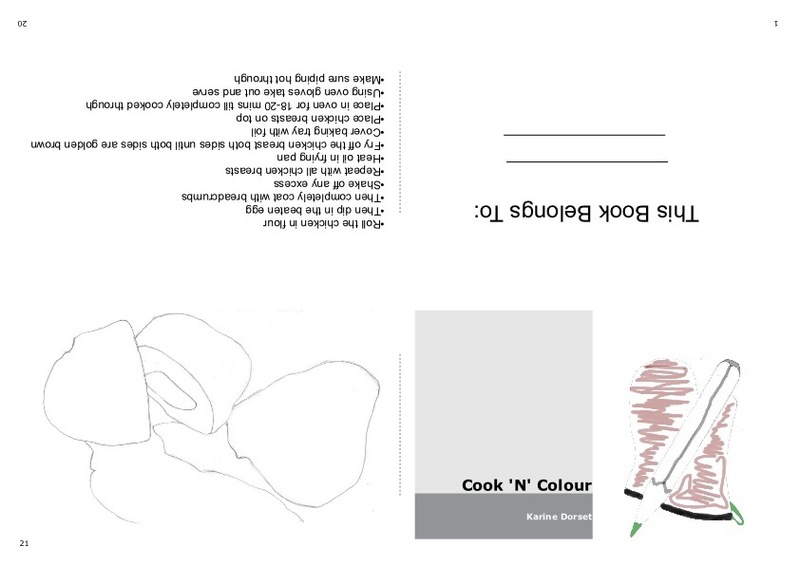 Cook ‘N’ Colour is another book that has been added to the set of family eBooks I’ve been working on. 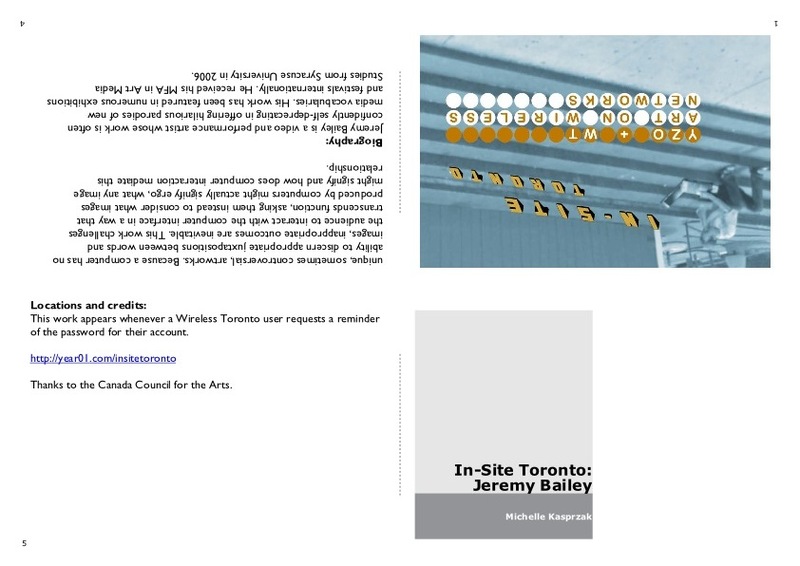 About : One of a series of publications to be produced by DodoLab as part of their ongoing work in Prince Edward Island (Canada). This book features text and photos by Andrew Hunter of a new work (a hand-made dodo bird made from recycled sweaters) by artist Paula Jean Cowan. 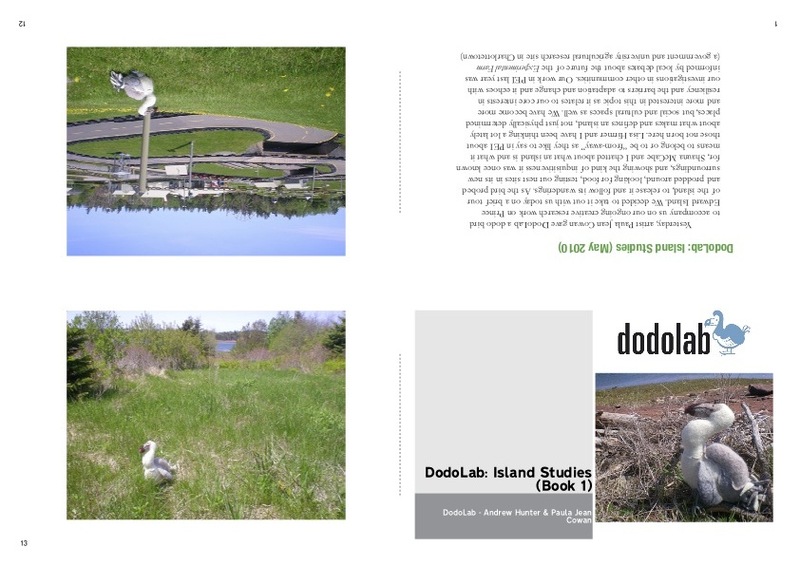 The bird is documented at various locations on the island and the text introduces the core focus of DodoLab’s PEI work and the emerging explorations of concepts of islands as physical, cultural and social spaces. Andrew Hunter is Director of DodoLab and Adjunct Faculty and Researcher at Waterloo Architecture Cambridge (University of Waterloo). DodoLab is an arts-based creative research program that employs experimental and adaptive processes to spark positive change and resiliency. 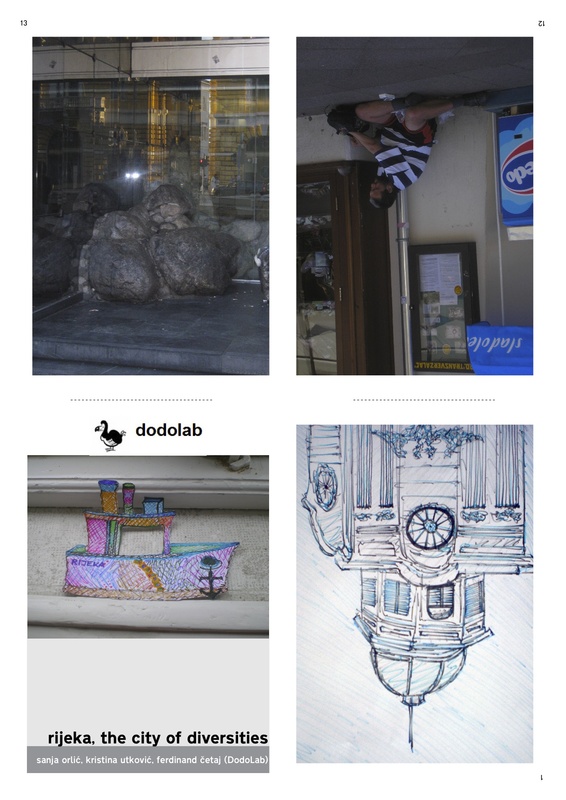 Led by Andrew Hunter with Lisa Hirmer, DodoLab’s focus is the complex relationships between people and their surroundings and how communities define, and are defined by, their environment. DodoLab puts the creative process at the heart of confronting social and environmental challenges and exploring barriers to adaptation and resiliency. 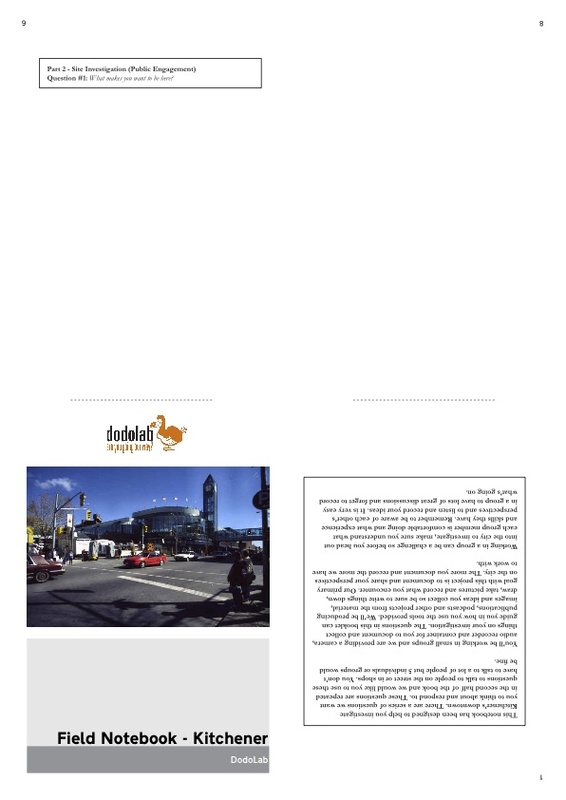 DodoLab is based in Cambridge, Ontario, and is a program of Musagetes and Waterloo Architecture. Paula Jean Cowan has been a bakery clerk, deli-girl, grocery clerk, produce manager, accounts receivable clerk, bookkeeper, receptionist, children’s art instructor, buyer & seller of used books, print & photo technician, truck washer, auto assembly line worker, parts inspector, and switchboard operator. Based in Sackville, New Brunswick, she produces work in a variety of media with an emphasis on teh hand-made that extends into her animated video works. Cowan has an MFA from the University of Guelph. 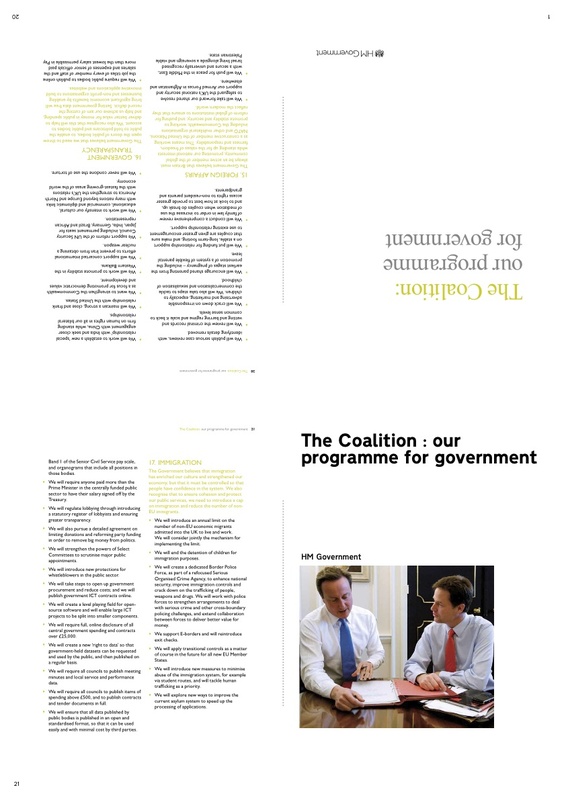 About : An A3/Ledger Diffusion eBook version of HM Government’s document setting out the programme for coalition government during the current Parliament. A Sort of Autobiography is a possible story of Waren Craghead’s life projected both back to his birth in 1970 and forward to his death in 2060. 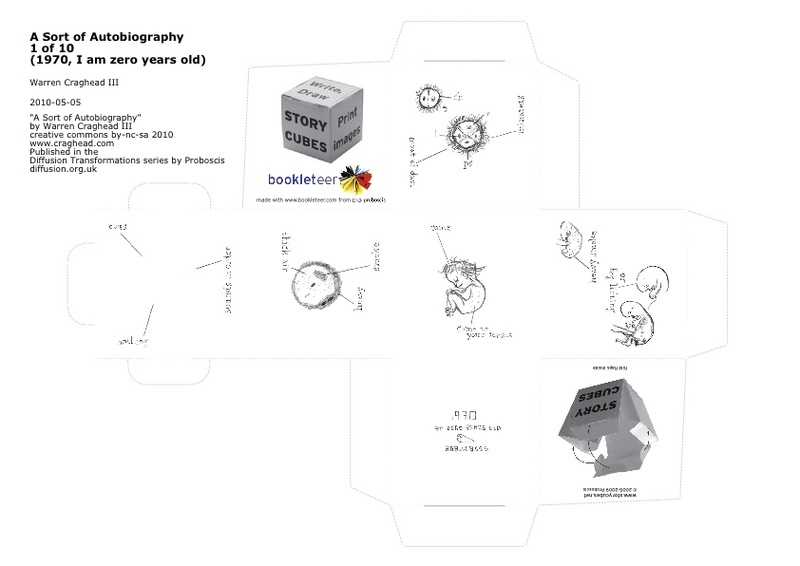 Each decade of his life is represented by a storycube as a rough self-portrait. 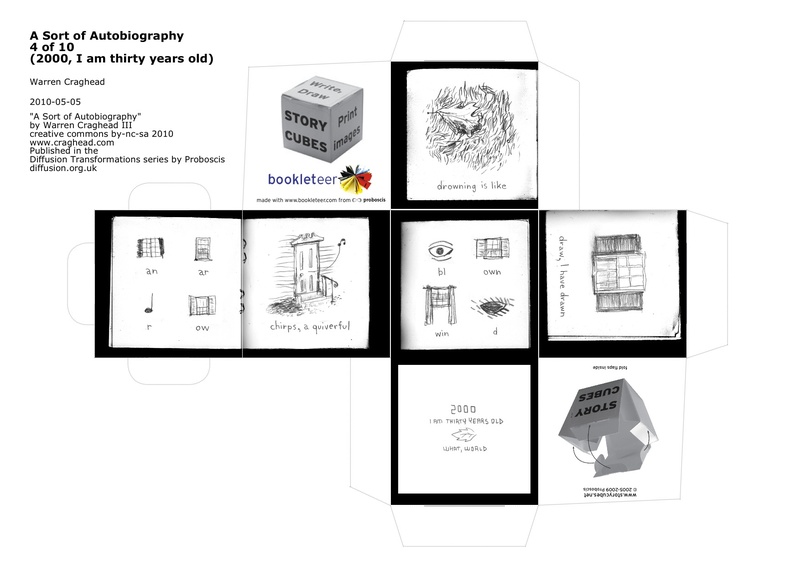 Drawn in various styles and encoded in different ways, the cubes tell a story of transformations – of mark-making, of physical appearance and of a life seen through drawing. 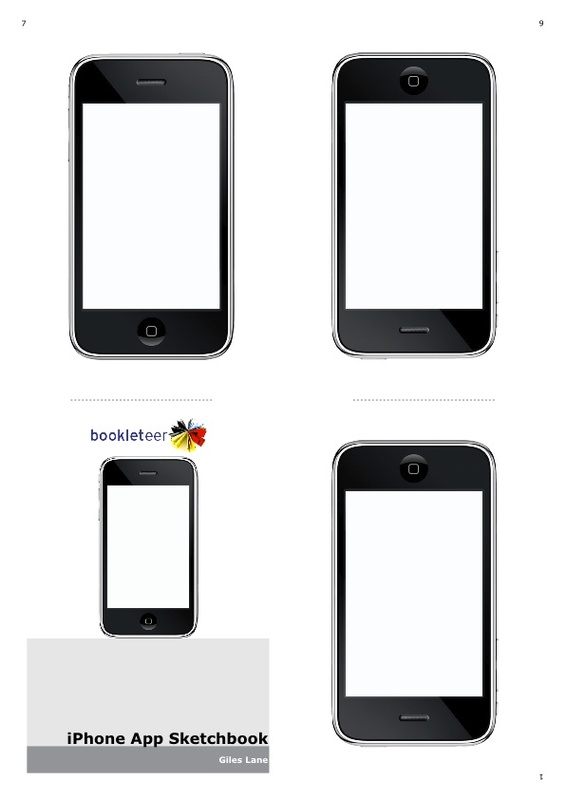 About : A simple sketchbook for iPhone App designers to sketch ideas on to-scale iPhone images. Created by Giles Lane for Proboscis. 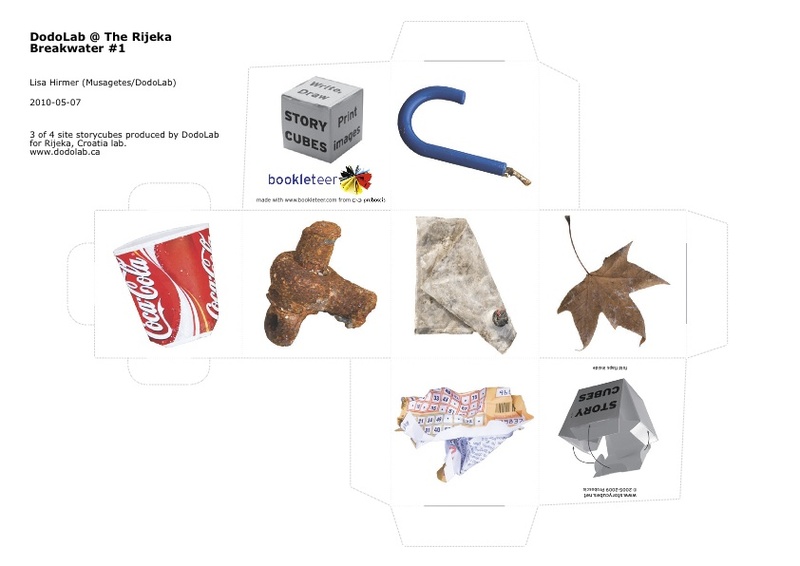 This set of four storycubes presents a selection of objects found at the Hartera Paper Mill and the Rijeka Breakwater – the sites selected for the Musagetes Café in Rijeka – during an advanced research visit in January of 2010. 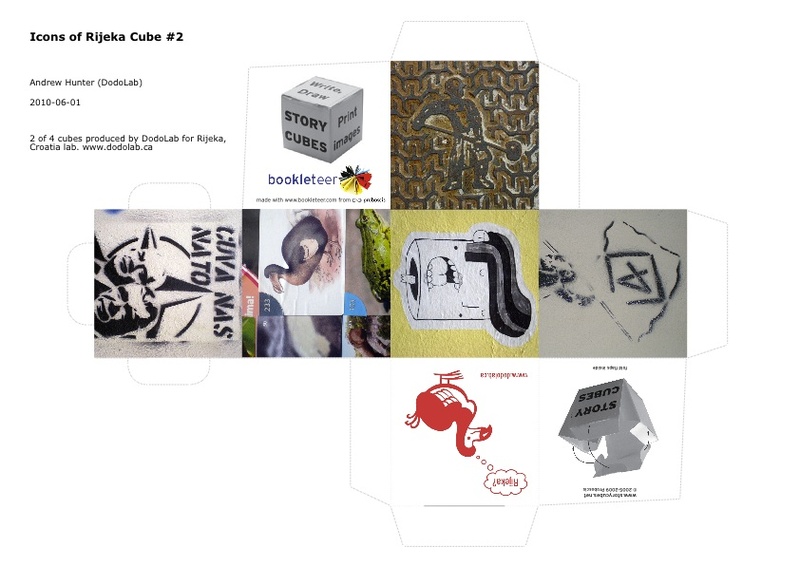 A limited edition of these cubes will be printed for DodoLab’s June residency and for participants in the Musagetes Café project in Rijeka. Lisa Hirmer has both undergraduate and graduate degrees in Architecture from Waterloo Architecture Cambridge. She joined DodoLab after completing a thesis about the significance of nature and wilderness in contemporary culture, particularly within a Canadian context. She currently splits her time between working with DodoLab and more traditional work as an Intern Architect. As an emerging landscape photographer, she is particularly interested in sites where the relationship between human intervention and natural process is ambiguous and complex. She recently won an Ontario Association of Architects Award of Excellence for her landscape photography. 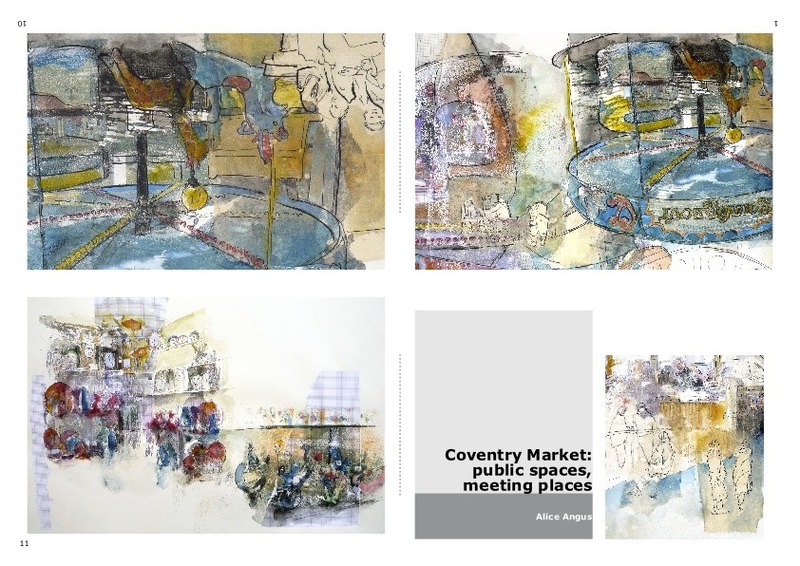 About : A book of drawings of Coventry indoor Market, by Alice Angus, commissioned for the artistsandmakers.com Empty Shops Network Tour created by artist Dan Thompson . 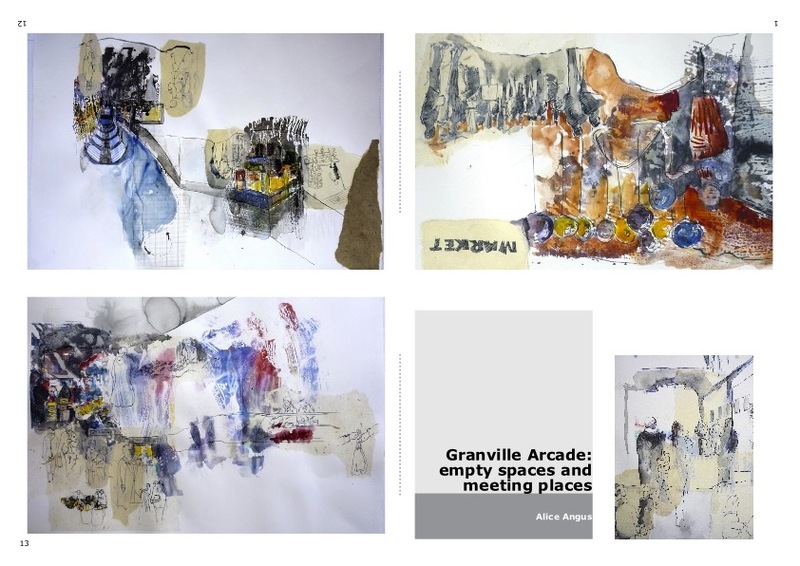 It follows from her earlier commission to draw Granville Arcade in Brixton for the tour, also an eBook available on Diffusion. 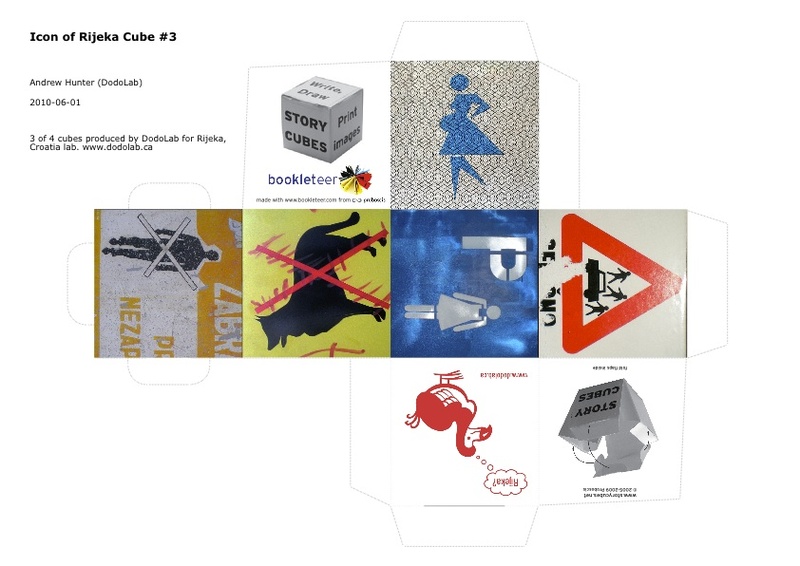 This set of four storycubes present a selection of images of signs and tags photographed by Andrew Hunter during research visits to Rijeka (Croatia) in January and April of 2010 while preparing for a public DodoLab program in the the city in the summer of 2010. 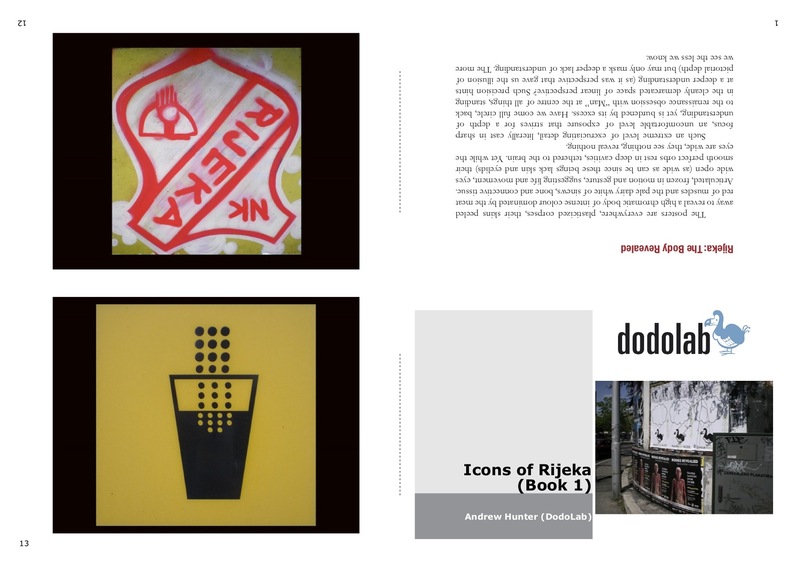 The cube set compliments the Icons of Rijeka ebooks also available through Diffusion. 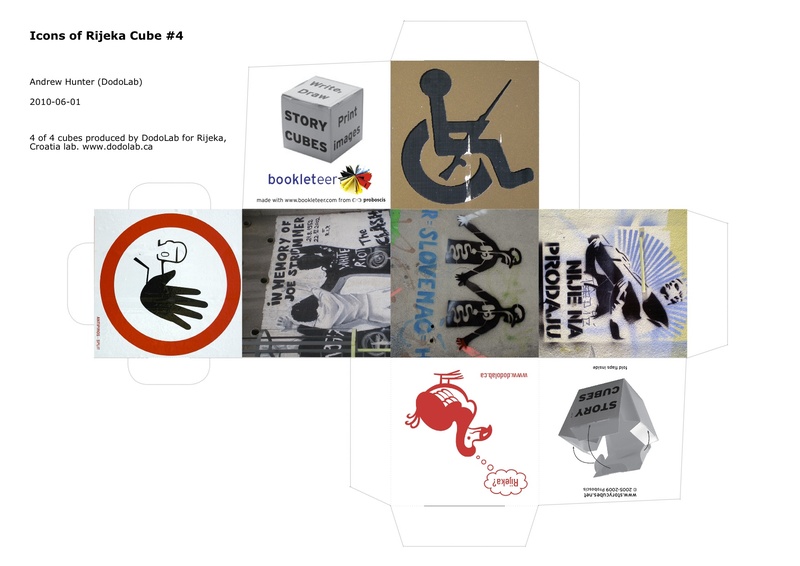 A limited edition of these cubes will be printed for DodoLab’s June residency and for participants in the Musagetes Café project in Rijeka. Andrew Hunter continues to also work as an artist, writer, independent curator and educator. 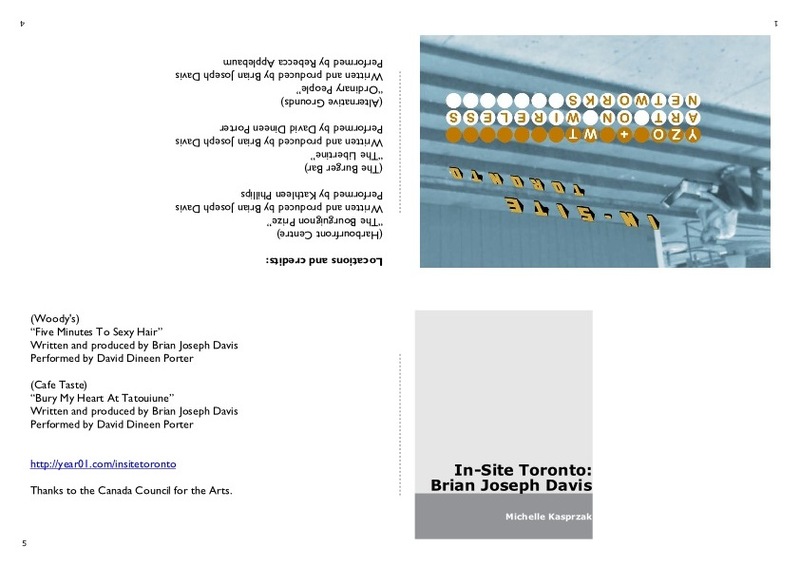 He has produced exhibitions, site projects, publications and writings for institutions across Canada in the United States and Europe. He has produced a distinct body of work on Canadian art and culture consistently emphasizing a broader vision embracing social and environmental issues and exploring nationalism, myths and popular culture. Collaboration has been central to Hunter’s practice for many years as his projects regularly include the commissioned and collaborative contributions of other creative practitioners, students and family members. 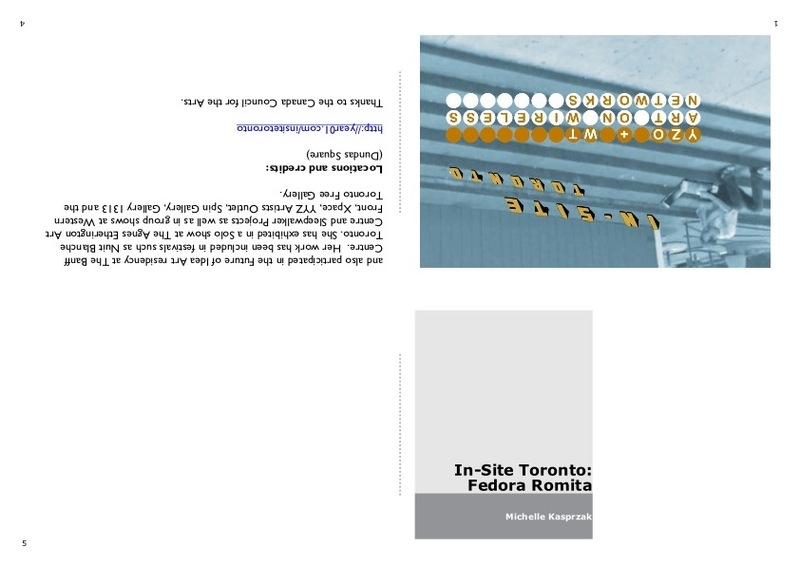 About : This series of eBooks has been created by Karine Dorset as part of her FJF placement at Proboscis. 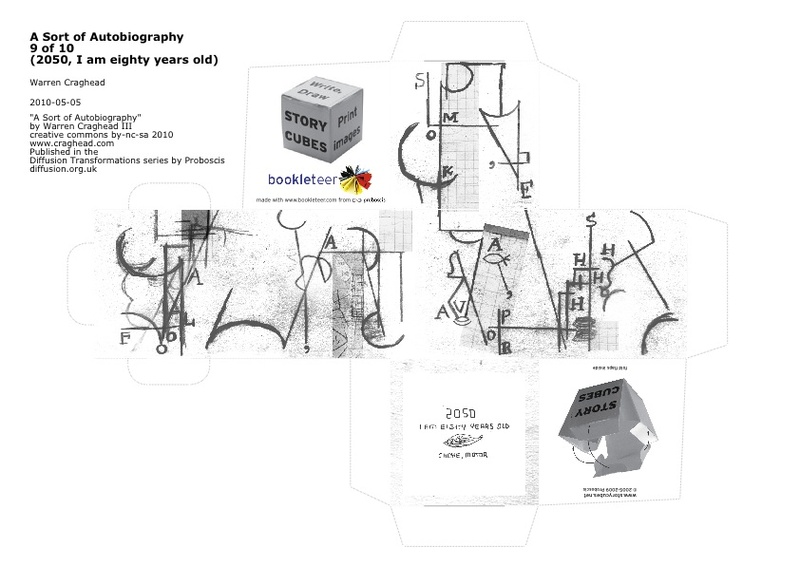 Her brief was to imagine different uses of bookleteer beyond the cultural and education focus that much of what’s been published has followed. 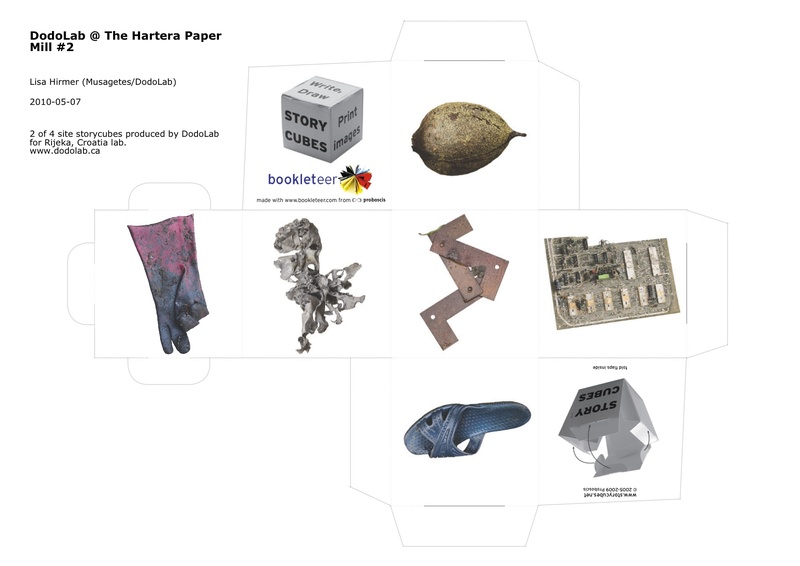 These first examples suggest a range of uses for eBooks and bookleteer for families. 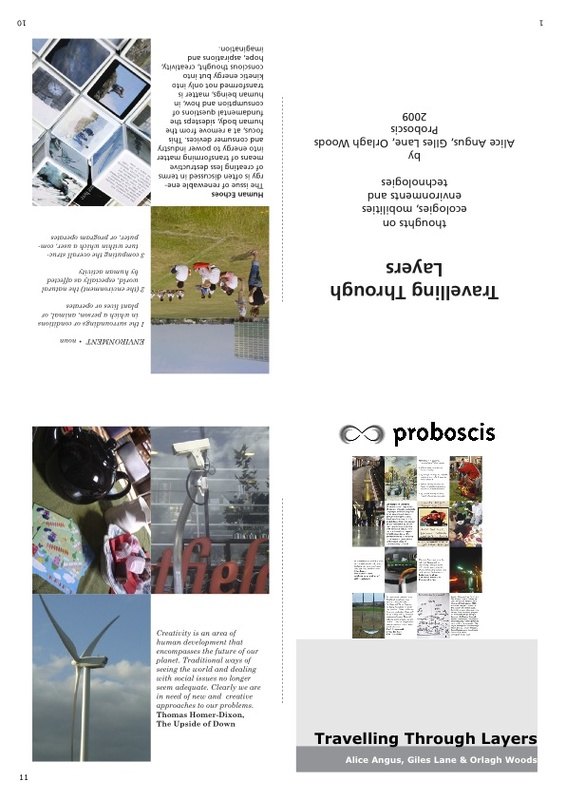 The first idea was to come up with different eBook usages. 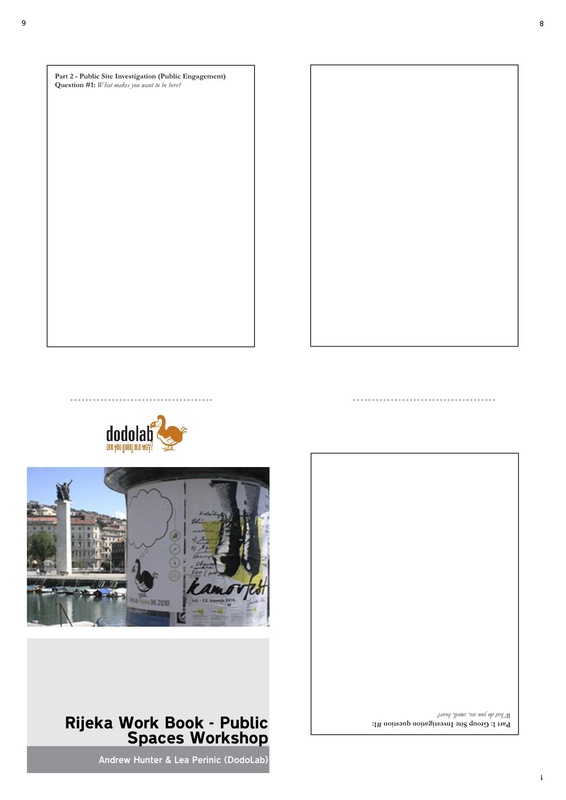 My original idea was to produce a simple template so the public could build on, upload items and produce their own invitations. Now it has been designed for any occasion, all you have to do is print off as many copies that is needed, then fill in all the information you desire. Maybe you can add your own personal pictures, very easy and simple to use. 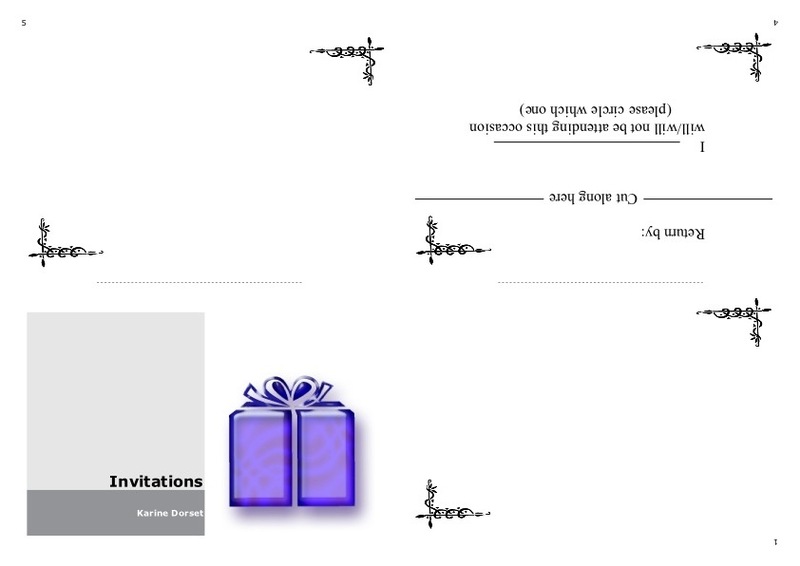 I got the cover image from the internet and just simple border patterns to decorate the invites. This eBook was created with children in mind. 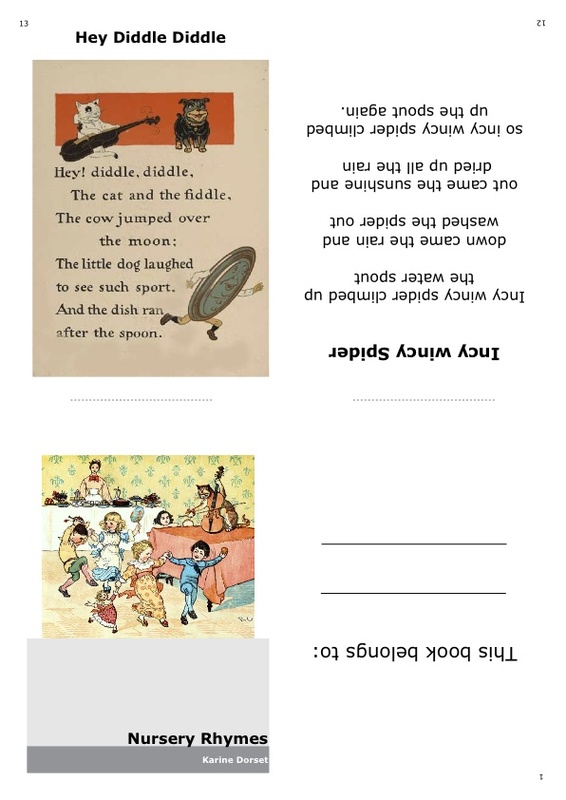 The idea was to bring the old traditional Nursery Rhymes back into this generation, remembered the way they were originally. Taking the rhymes and images from commons.wikimedia.org/wiki/Main_Page, I cut and stuck, moved around and tried many different ways of presenting this eBook before using computer resources. 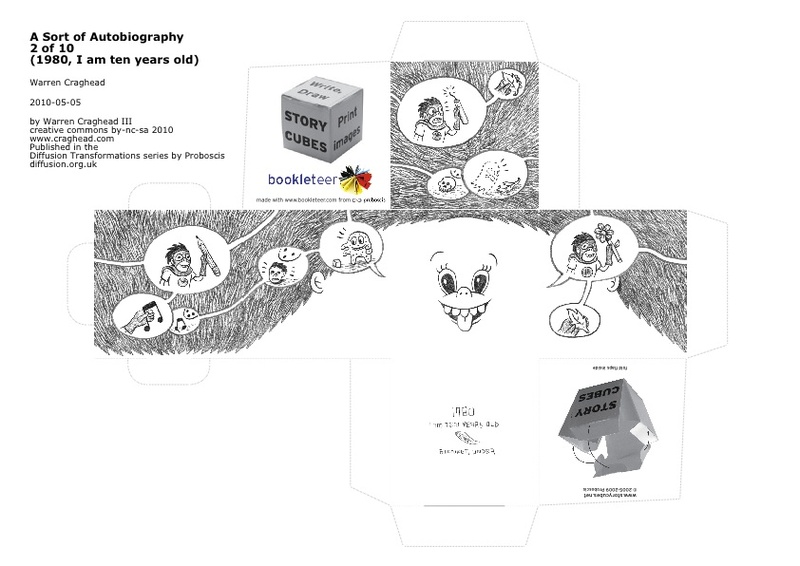 The final copy was made and designed so it can be in travel pocket size for children to read. Just like most of the population I like puzzles, numbers or word games like you see in the newspaper or the A4 puzzle books, so my idea was to make a personal eBook out of them, one which you could do traveling anywhere. I made the Word-searches, Cross words and Cryptogram puzzles myself through a puzzle maker on the internet. I used Sudoku and Criss Cross puzzles from copyright free websites. 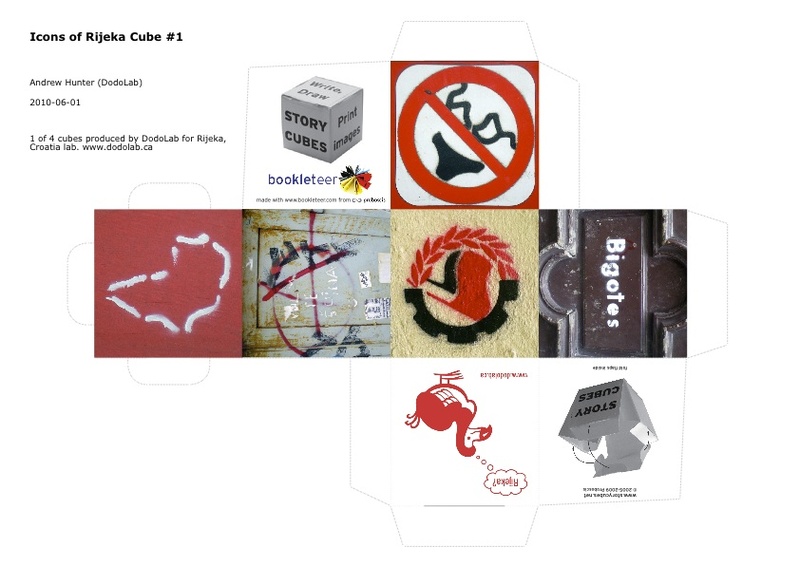 The name ‘Travel Games’ came from brainstorming ideas, then uploaded through bookleteer and made into this eBook. 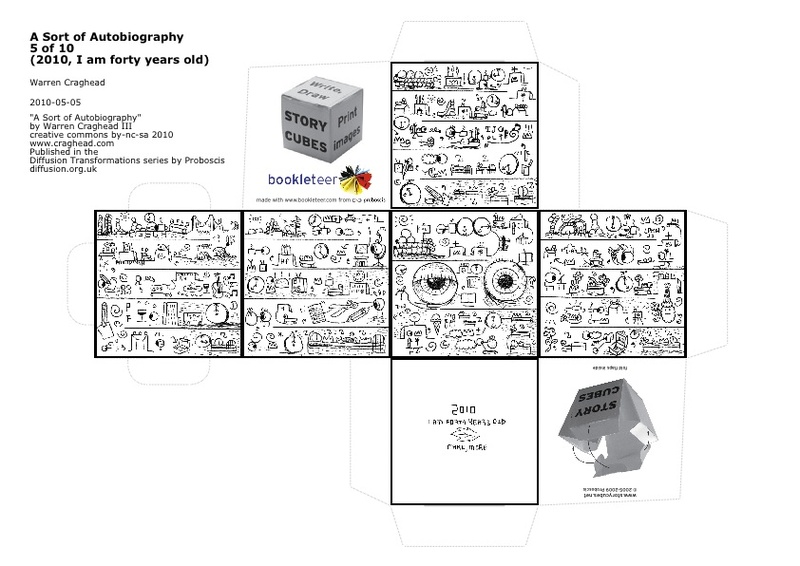 The colouring book was designed and created using Neo Office, Open office and Firefox. The idea was to get all types of images from animals, to places, from food to people etc, for children to get creative and colour. It was also designed for travel fun but can be used where ever, whenever. But it’s not just a colouring book, its good a bit more activity. You can fill in the images by numbers allocated to the right colour, or just write about the image that you did colour. About : Icons of Rijeka (books 1 and 2) presents a selection of images of signs and tags photographed by Andrew Hunter during research visits to Rijeka (Croatia) in January and April of 2010 while preparing for a public DodoLab program in the summer of 2010. 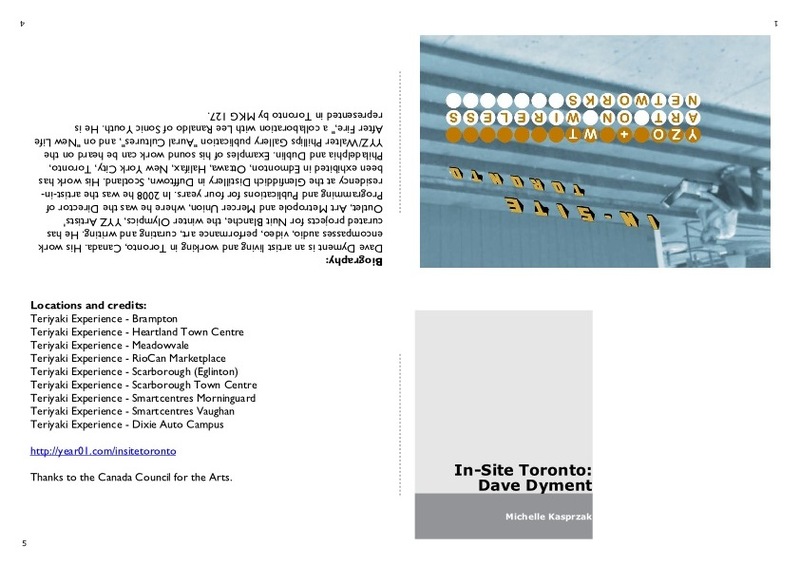 The publication includes a brief text by Hunter reflecting on the process of engaging with and reading the city through both official signage and graffiti. 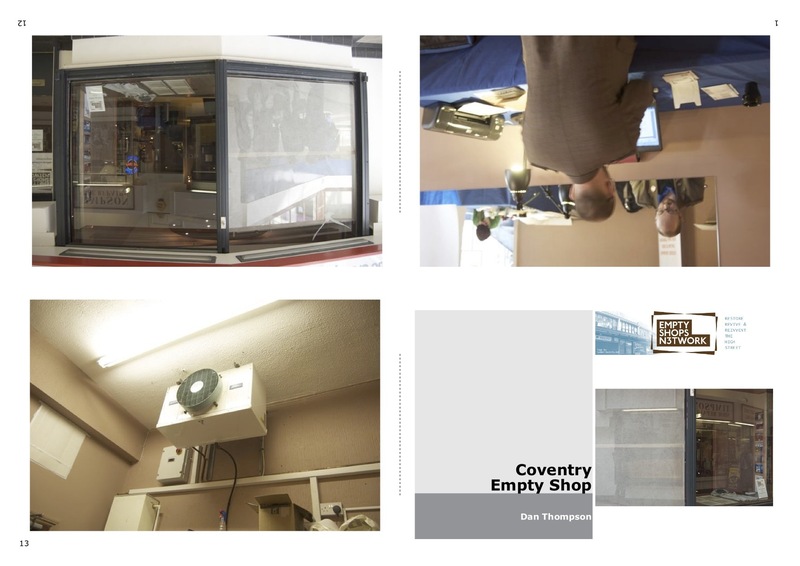 About : Photographs and a brief description of the third week of the Empty Shops Network Tour in Coventry. Dan Thompson is an artist and writer with an interest in using redundant spaces which has taken in theatres, cinemas and empty shops. He has written widely about empty shops for arts and regeneration magazines. he is founder of the Revolutionary Arts Group and the Empty Shops Network. 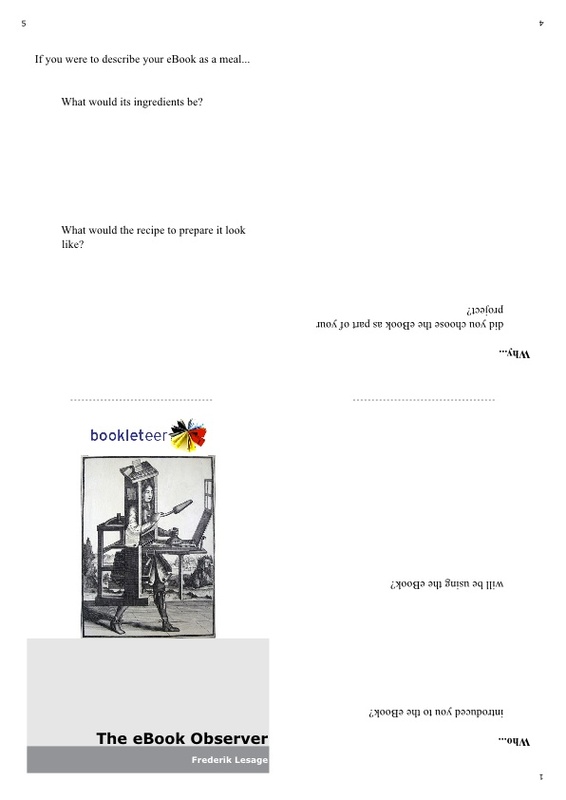 About : An eNotebook for gathering user experiences and uses of bookleteer.com for an ongoing investigation into its application and potential. This eNotebook is designed to collect feedback from anyone who has either used Diffusion eNotebooks/eBooks or bookleteer.com. 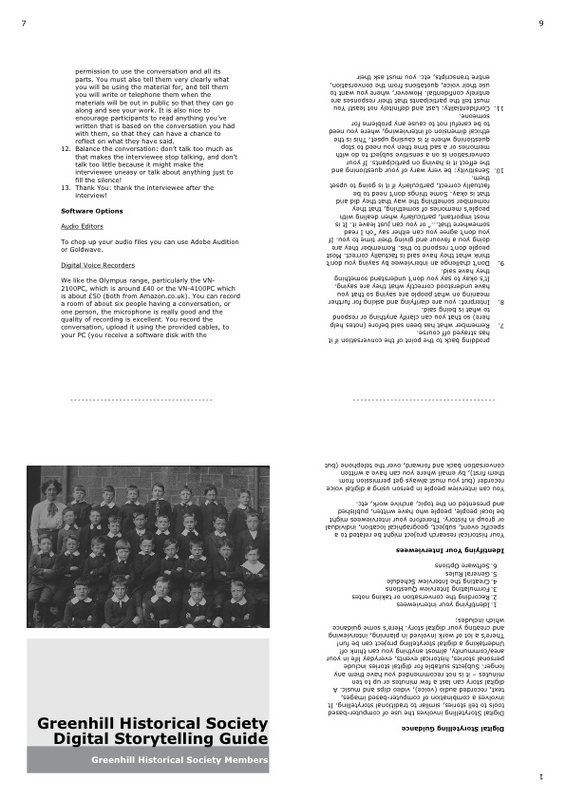 Please print out the eNotebook, fill in the questions and return to Proboscis – either by post or by scanning and emailing the completed eBook to us. Frederik Lesage is a Teaching Fellow at Kings College London in the Centre for Culture, Media and Creative Industries and LSE Fellow at the Media and Communications department of the London School of Economics and Political Science. 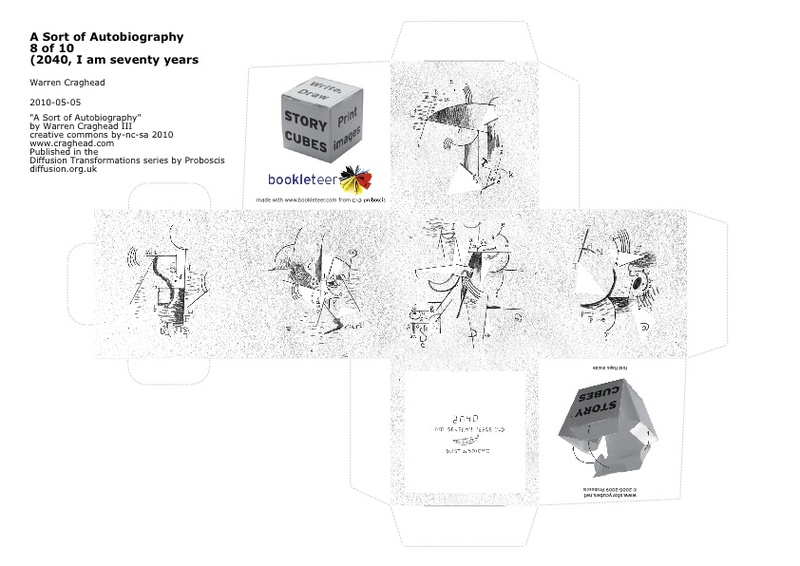 bookleteer Print On Demand arrives! 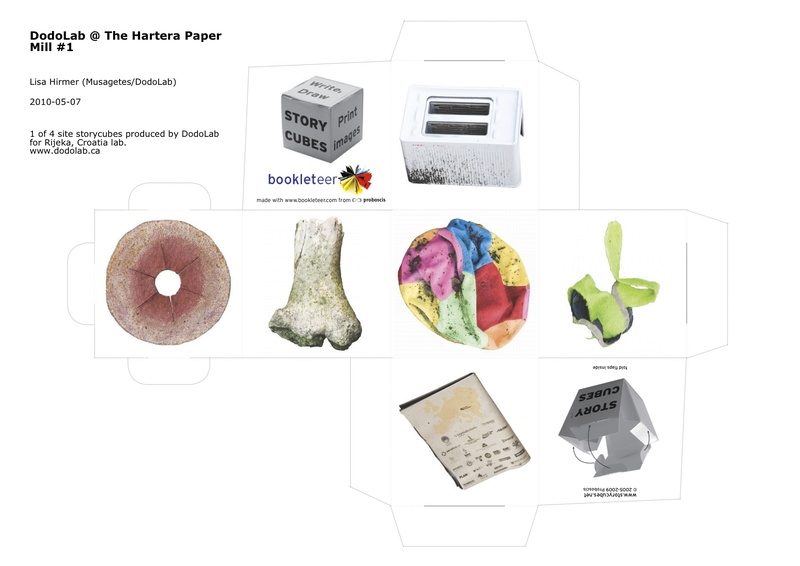 We’ll be sending out some samples to friends, colleagues and bookleteers, meanwhile we will start accepting orders for POD eBooks & StoryCubes from April 12th. 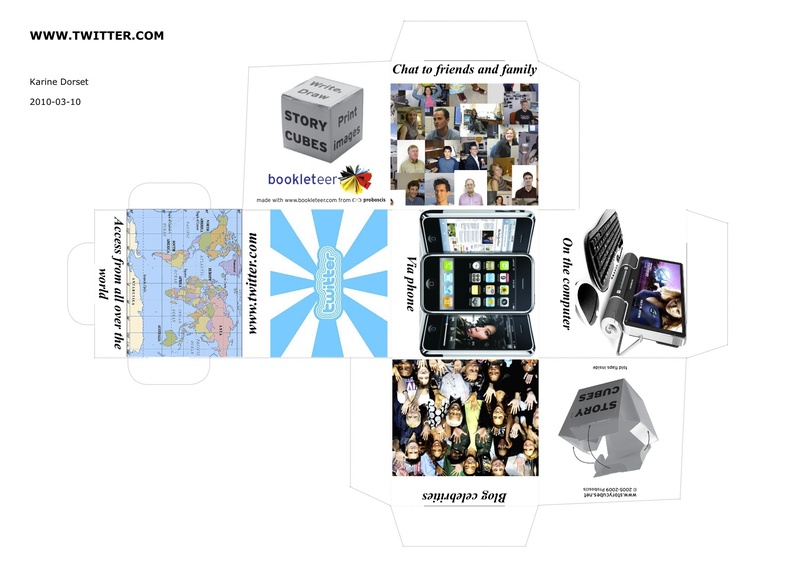 For more information on bookleteer’s POD service please visit the bookleteer blog. 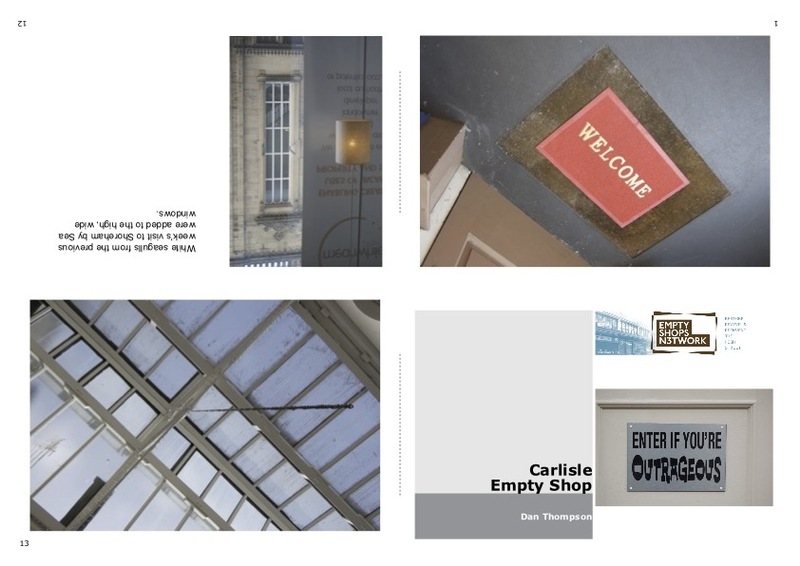 About : Photographs and a brief description of the second week of the Empty Shops Network Tour in Carlisle, Cumbria, hosted by Arcade Art. 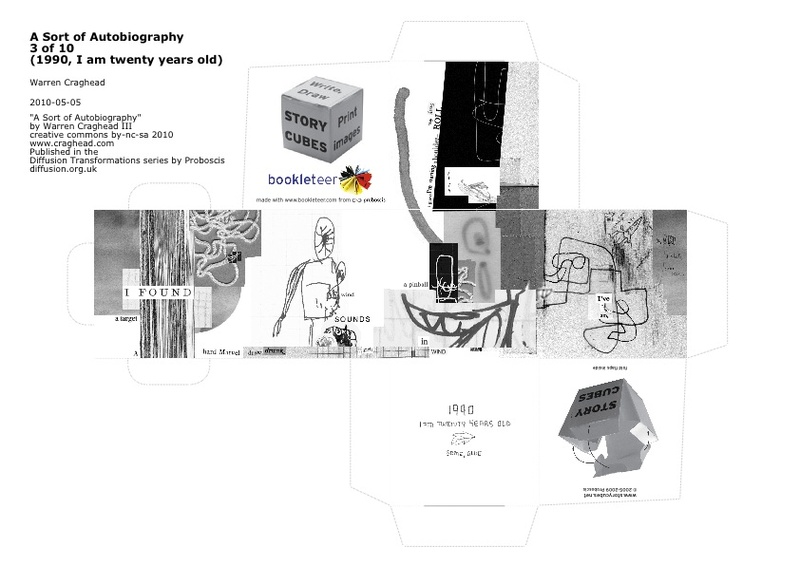 About : an eBook by Alice Angus to accompany a set of drawings (Ecologies, Time, Landmarks, Traces, Wilderness, Perception, 2010) created for a touring show during the 25 year anniversary of Ivvavik National Park in Canada which was created by a historic Aboriginal land claim settlement. 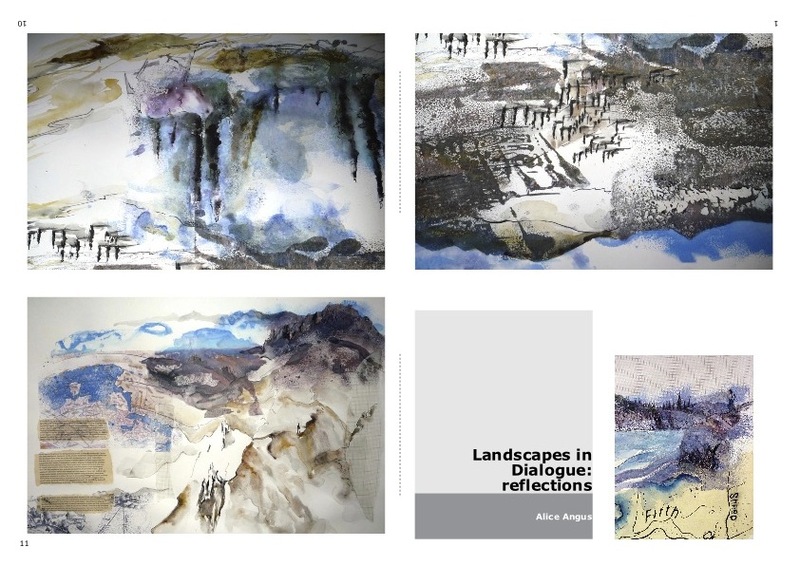 These works are a reflection on the experience of a Parks Canada residency in Ivvavik and the long term issues of ownership, belonging, common space and environment, raised by the trip. 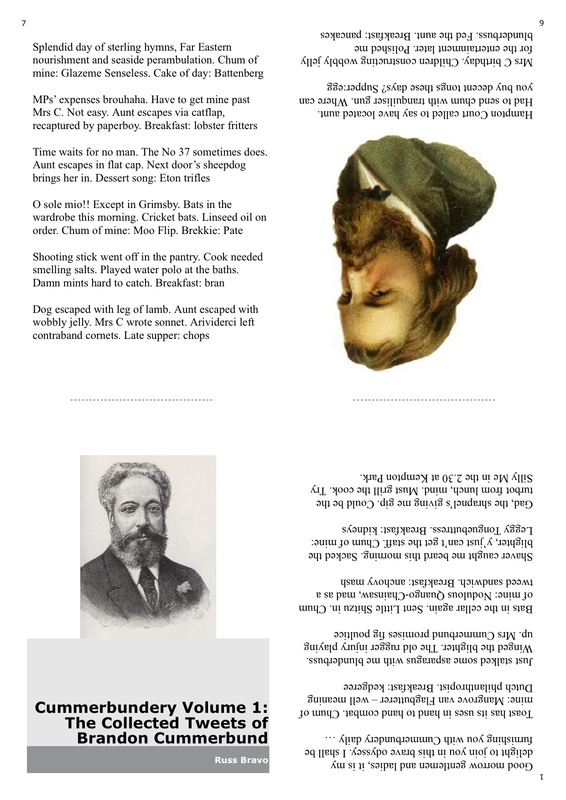 Cummerbundery Vol 1: The Collected Tweets of Brandon Cummerbund provides a brief introduction to the considered work, breakfasts and nonsense of this eccentric gent. Enjoy. His agent, the Rt Hon Russ Bravo, may be contacted for speaking engagements at the above blog. About : A book of drawings by Alice Angus made during a week long project exploring Granville Arcade in Brixton Market on the first leg of artistsandmakers.com Empty Shops Network Tour to six towns across England, created by artist Dan Thompson. Alice joined Dan, Jan Williams (Caravan Gallery), Steve Bomford, Natasha Middleton and podcaster Richard Vobes, for lively discussion and to create new work on site, you can hear Richard Vobes podcasts of about the project here. The tour has been organised by the Empty Shops Network, with the first event happening just a week after the project was conceived at a meeting of organisations involved in bringing empty shops and spaces into meanwhile use. After Brixton, the Empty Shops Network project will visit five further towns, with dates in Shoreham by Sea, Coventry, Cumbria and Durham to be confirmed in coming weeks. See artistsandmakers.com for details. You can see drawings and images from the Brixton week here. 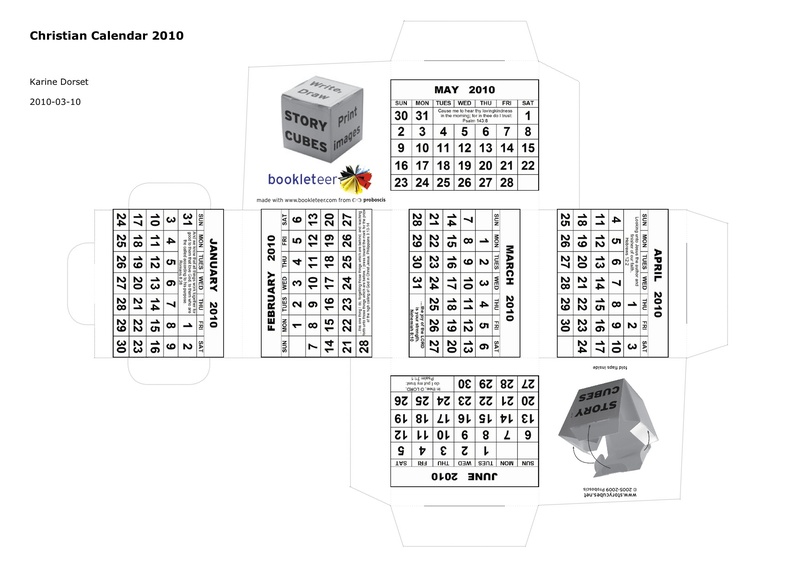 About : “The calendar cube was about making it 3D: the fact that the cube has 12 sides fitted brilliantly with idea because there’s 12 months. I searched for and downloaded the images from www.google.co.uk, which had its own christian verses and made the calendar a bit unique. Put the cube together and get the first 6 months, then undo and redo the other side for the next six months. 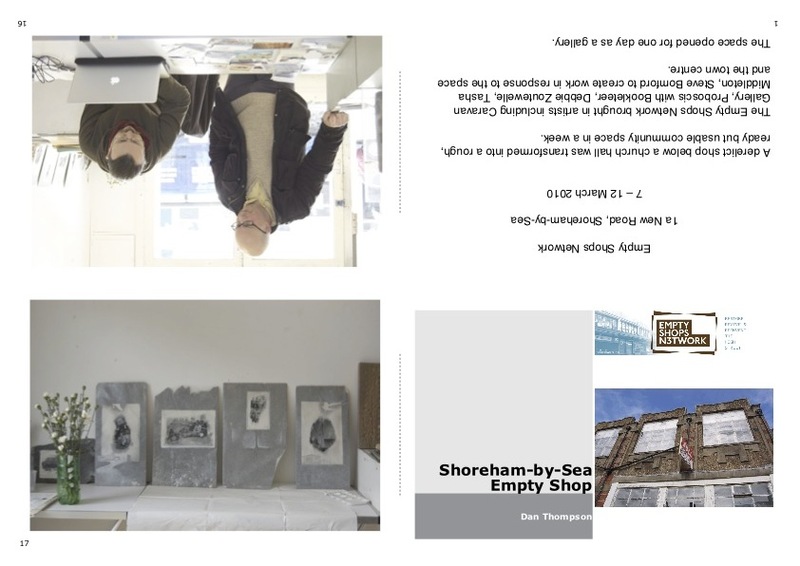 About : Photographs and a brief description of the first week of the Empty Shops Network Tour in Shoreham-by-Sea, Sussex. Dan Thompson is an artist and writer with an interest in using redundant spaces which has taken in theatres, cinemas and empty shops. He has written widely about empty shops for arts and regeneration magazines. he is founder of the Revolutionary Arts Group and theEmpty Shops Network.